Meet Chrystal Docken, a pioneering scholar in diesel technology. Not the traditional male diesel tech student, Chrystal Docken revs up whenever the conversation turns to Cummins and Caterpillar. As a single mother of two girls -Riley (7) and Dallas (3) – Chrystal loves showing her girls around the EITC campus and diesel shop, since her love of trucks began at a very young age. “When I was seven years old, I dreamed of buying the Chrysler Corporation and renaming it ‘Chrystal’,” she says. She is in a happy place right now fully engaged- attending EITC full-time, working full-time on the late shift at Kenworth Truck Sales Company, and rearing her two girls. Her future is now bright. Chrystal’s 25 year life journey has not been easy. Born in Minneapolis, Chrystal moved with her family to Idaho when she was three. Chrystal and her siblings (two sisters, one brother) grew up with Mom but not Dad (who will be released soon from prison). Chrystal attended Lincoln high school but dropped out after one year. She was an A student who became bored with the classroom learning style. She married young and found herself in the wrong crowd, addicted to methamphetamine, and headed down a dead-end road. With incredible fortitude, Chrystal broke the chains of addiction and re-routed her life by divorcing her husband and seeking help. She sought help from The Haven Shelter in Idaho Falls. The Haven provided her and her children with short term housing and supportive services, including help and encouragement to study and pass the General Education Development (GED) test. Chrystal expresses her gratitude to The Haven for helping her and her children in a time of need. “The Haven was the key to open the door to a better life. 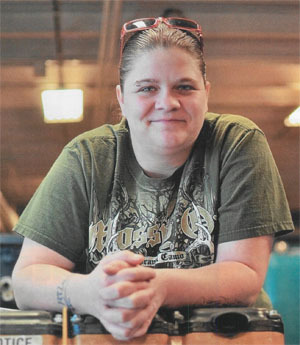 If it wasn’t for them it could have taken me five, ten more years to figure it out for myself.” After Chrystal received her GED, she realized that going to college was the only way to become a successful diesel mechanic and chose Eastern Idaho Technical College to pursue her degree. The EITC Diesel program provides the top students with the opportunity to intern at local diesel shops. Chrystal is one of those top students. She is currently doing a paid internship for Kenworth Sales. Western States CAT hosted Chrystal as an intern during her Fall 2012 semester. She has enjoyed every minute of working in these professional shops. Chrystal oozes excitement for her May 2013 graduation where she’s excited to show her scholarship donors- the Idaho Falls Rotary Club # 1041 and Eastern Idaho Chapter of Veteran’s Motor Car Club of Americathat their investment was worth it. “They are making a huge difference in my life and those of my children by helping me pay for school and become the role model I want to be for my girls,” she says.